I hopped over to see what beautiful cakes Patricia over at ButterYum had been making recently, and was slightly confused when I saw a gorgeous pasta salad instead. I had to double check her pink background to make sure I was at the right place! I guess cake decorators need to eat more than just cake to survive. Trying to get through a huge Costco sized bag of Meyer lemons, I made the lemon vinaigrette from Giada’s Family Dinners for the dressing. Patricia likes to use her favorite bottled balsamic vinaigrette, which sounds excellent as well. Blend the lemon zest and juice, parsley, garlic, salt, and pepper in a blender. With the machine running gradually blend in the oil. Season the vinaigrette to taste with more salt and pepper. Cook the cappelletti according to the directions, drain, and rinse with cold water. Move the pasta to a large serving bowl and toss together with the rest of the ingredients. Lemon vinaigrette recipe belongs to Giada De Laurentiis. Picture and write-up by Laura Flowers. I love all yours posts and this one is no exception! This looks like a new favorite! Hi Laura - thanks for writing about my favorite pasta salad! I can't wait to try your lemon vinaigrette... sounds divine! Wish I could find your cute little mozzarella 'pearls'. I can get bocconcini, but they are too big (and sometimes they taste a little off). I like your choice of cappelletti too - I'll have to look for that shape. I'm a sucker for pastas... I go on vacation and bring home pasta shapes I can't find here. If you come by please read this. I can't get onto your site from any of the three computers in my house. I've been trying for a couple days with no luck. I wanted to let you know in case others were having this problem. Laura, this is Mary from One Perfect Bite. I don't think anyone else is having problems. Can you describe what is happening --- my email address is oneperfectbite(at)yahoo(dot)com. This is a beautiful pasta dish. Your photo is inspiring! I am totally making this this summer! Bookmarked! I too love YOUR blog..where on earth did you find Mozzarella pearls? I found a tub of them at Costco. They were such cute little things. I love those pasta dish at this time of the year. Perfect for lunch or picnic. You will not believe this : yesterday I was strolling around town with hubby and it was the first really warm day. I said "This warm weather makes me dream of and crave Nonna Anna's fabulous pasta dish - warm pasta tossed with chopped fresh tomatoes, chopped basil and mozzarella. Simple but oh so perfect!" and here you are with an amazing salad almost the same! But I love that you tossed it with a lemon vinaigrette! I will be making this soon. We love caprese in our house - we have never tried a pasta though! This looks great! Hi Laura the salad dressing looks fabulous. Ok, I am going to need your help.. PLEASE. Next weekend I will have a BBQ at my house for my birthday. We are making grilled cheddar burguers with applewood smoked bacon, hot dogs and brown sugar grilled chicken. ( I am not that smart to come up with the idea, I got it from my Wegmans magazine) I will need two side dishes that can go with all the food, I just don't know what and I don't want to make a boring green salad. Do you have any easy to prepare and delicious suggestion for me? you can write me at castrokm@hotmail.com Thank you so much. I just sent an email your way. I hope it helps. Thank you! 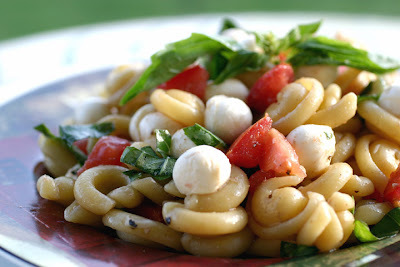 I have a Costco I will check for certain..My next time there..
Caprese pasta salad sounds outstanding right now. I always feel bereft when basil's not in season - I think this is a perfect recipe to celebrate the fresh basil I just found at Whole Foods! Love your choice of pasta. It looks so fancy in this Caprese salad. oooh! I love this one! You have a great collection of recipes here and photos! I made this last night for a girls night party. It was a hit! Everyone loved it...and I can't wait to make it again. So easy! So delicious!